After many years, historian and Helen Keller expert Kim Nielsen realized that she, along with other historians and biographers, had failed Anne Sullivan Macy. While Macy is remembered primarily as Helen Keller’s teacher and mythologized as a straightforward educational superhero, the real story of this brilliant, complex, and misunderstood woman, who described herself as a “badly constructed human being,” has never been completely told. Beyond the Miracle Worker, the first biography of Macy in nearly fifty years, complicates the typical Helen-Annie “feel good” narrative in surprising ways. By telling the life from Macy’s perspective-not Keller’s-the biography is the first to put Macy squarely at the center of the story. It presents a new and fascinating tale about a wounded but determined woman and her quest for a successful, meaningful life. As an adult, Macy taught Keller, helping the girl realize her immense potential, and Macy’s intimate friendship with Keller remained powerful throughout their lives. Yet as Macy floundered with her own blindness, ill health, and depression, as well as a tumultuous and triangulated marriage, she came to lean on her former student, emotionally, physically, and economically. It’s temp ting to begin this book like a fairy tale. Once upon a time a poor, blind, and orphaned child named Annie magically grew into a happy, sighted, and successful adult woman. She became a miracle worker, lighting the intellectual fire and imagination of the deaf-blind girl Helen Keller at a water pump in the wilds of Alabama. We know this kind of story. Many of our books and movies, the morality tales and parables we tell, even the heroes we’ve created, are versions of the same inspirational tale. The cheerful and uplifting message is that yes, you too can conquer anything in order to do the impossible. “Any book about me,” Anne Sullivan Macy reflected near the end of her life, “must be full of contradictions.”1 Beyond the Miracle Worker is a book that reflects these contradictions--the contradictions of a delightful, gloomy, charismatically fascinating, and annoying woman who was neither blind nor sighted. Though she was born in 1866, her life is a surprisingly contemporary tale. It is the story of a caring, fiercely proud, and intelligent woman trying to forge meaningful human relationships despite her own ingrained flaws and wounds. It is the story of a woman deeply frightened of depending upon anyone else for emotional, economic, or social sustenance. Though it may have been through the back door, and blunder she did, she entered into life fully. After comp leting two previous books on Helen Keller I swore I would never again write anything even remotely related to her. I started a project far removed from Keller. I informed everyone in my professional circle about that far-removed project in order to commit myself to it. Then I reread Anne Sullivan Macy’s 1916 letters to Helen Keller. Macy had written them as she dealt with the illness that she thought would kill her. The letters reveal an introspective woman trying to understand her life. Vacillating between urgency and detachment, she reflected on pleasure, anger, complacency, and amazement. It struck me that her life embodied both contradictions and intensity: physical pain, emotional pain, isolation, friendship, joy, intellect, tenacity, success, and near constant self-doubt. Yet, as she thought about death, as she pondered her life, she took immense joy in the daily life of the Puerto Rican countryside where she was staying. As I reconsidered Macy, I became convinced that I, and nearly everyone else, had shortchanged the woman known only as the teacher of Helen Keller. 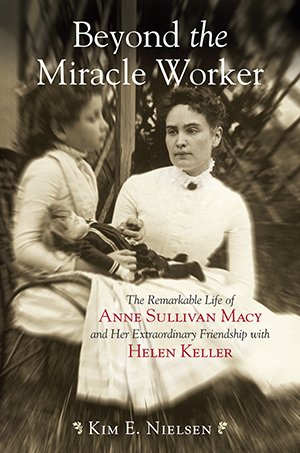 A new biography of Anne Sullivan Macy is greatly needed, not only to do justice to her and to provide a peephole into Keller and Macy’s multifaceted, and often surprising, friendship, but also because our cultural memory mythologizes and simplifies Macy as a straightforward educational superhero. She deserves more. In addition, the increasing but still slow integration of people with disabilities into education, the workplace, and the public world makes this project significant. Macy’s disability did not occur in a vacuum, isolated and abstract. Her daily experience of it was often defined by context--by institutions, by the expectations of others, and by the lack of social welfare support. Her life story, particularly when placed alongside that of Keller, reminds us of the diversity of disability experiences historically and today--and of the multiple ways that we, as individuals, as institutions, and as a country, contribute to the disabling nature of physical and mental impairments. Surprisingly, telling the life story of Anne Sullivan Macy with her as the central figure is a markedly new strategy. Numerous Keller biographies, both older and more recent, discuss Macy but primarily as an ancillary figure to the real star of the story. These include Joseph P. Lash’s Helen and Teacher: The Story of Helen Keller and Anne Sullivan Macy (1980) and Dorothy Herrmann’s Helen Keller: A Life (1998). Helen and Teacher provides the most complex analysis of Macy but retains a nearly exclusive focus on her development and life as a teacher. The most comprehensive biography of Macy is that of Nella Braddy Henney, Anne Sullivan Macy: The Story Behind Helen Keller (1933). Endorsed by Keller, approved by Macy, and written by an intimate friend of both women, this book sought to establish Macy as a pedagogical hero. Macy’s most recent adult biography, published over forty years ago by Lorena Hickok, also defines her only according to Keller--even in its title: The Touch of Magic: The Story of Helen Keller’s Great Teacher, Anne Sullivan Macy (1961). Macy was Keller’s teacher, and proud of it, but her life story is so much more complicated and interesting than that single-minded characterization. The goal of Beyond the Miracle Worker is to present Anne Sullivan Macy in all of her complexity. First and foremost, by telling and analyzing Macy’s life as her story--not Helen’s--this biography tells a new tale. Beyond the Miracle Worker follows the accidental and unexpected path an orphaned asylum child took to become a world-famous educator. This includes an intimate depiction of growing up amidst the horrors of a mid-nineteenth-century asylum, a rarely if ever told story in U.S. history. It chronicles a tumultuous marriage. It analyzes the adult life of a chronically ill, disabled woman whose public identity excluded nearly all acknowledgment of her disability. It follows a smart and ambitious woman trying to make a professional life in a patriarchal society. And it traces the ever-changing friendship between Macy and Keller, in which the deaf-blind Keller eventually cared for and became the personal aid of her former teacher. In many ways, Macy resembles an archetypal American figure--the self-made man. As a young orphan housed in Massachusetts’s Tewksbury Almshouse, she pleaded her way out with single-minded determination by literally pulling on the sleeves of touring philanthropists and begging for an education. Later on in her life, she exercised further determination and retained control of the child Helen Keller--and thus of her own professional life--despite the machinations of numerous others who were far more powerful. With intense purposefulness, she repeatedly created herself. The obvious complication, however, is that though a “self-made man,” she was female, disabled, and of (to her) shameful beginnings. Her life raises questions about the opportunities available to women to reinvent themselves in turn-of-the-century America. A related theme is that of the narrow but changing economic and professional opportunities available to women. Macy is contemporary with the first generation of female college students who embraced pivotal and important roles in U.S. social reform, education, and civic life. She is a contemporary of those who--like Jane Addams, Julia Lathrop, and Florence Kelley--developed and energized the settlement house movement. She is, however, dramatically different. Though an extremely brilliant woman, she lacked any educational training or advanced degree, came from a family with no connections to wealth or prestige, was deeply ashamed of her past, and had little involvement in broad social reform. Other than her relationship to Keller, she had few opportunities to build on for personal advancement. Those she had came from flirtatious relationships with older men. From the time of Keller’s college graduation in 1904 until the early 1920s the two constantly sought new economic opportunities and stability as various money-making attempts failed. While she and Keller clearly valued one another, Macy clung to the relationship with such tenacity partially because of the narrow options available for a woman of her class and background, let alone one with a disability. Also important to this biography and Macy’s life is the theme of education. As a child, Macy grasped for an education as an escape, and a redemption, from poverty and the almshouse. As an untrained, inexperienced, and isolated young woman she accomplished a task many had thought impossible: teaching language to the almost sevenyear- old deaf-blind Helen Keller. Though not a Radcliffe student, she attended the prestigious female college alongside Keller, fingerspelling for her all lectures and books. Ironically, the woman who became one of the world’s most famous educators had no educational training, and did little regarding the education of others after her one student became an adult.